When it comes to driving for Uber, anything less than a 5 star rating is considered failing in their books. This causes a necessity to perform well on the Uber platform so that way you can keep driving. Once your rating drops below, typically, a 4.6 star average you start becoming a red flag for Uber. This is why you never hear about a 3 star driver picking up passengers. They don’t exist because they’re booted before they have a chance to get that low. Today, I’m going to talk about 21 things you should and should not do to keep an Uber driver 5 star rating. While it’s impossible to stay a perfect 5.0, these tips will help you stay pretty close to near perfect. While you may not want to do everything on this list because some things involve money. The purpose is to maintain an excellent rating or you could end up getting kicked to the curve and end up losing out on future income from driving with Uber. You don’t have to do all three, but picking at least one of them can help give a passenger a much better experience resulting in a much better rating. Most people won’t take you up on this offer, but it’s the thought that counts and can go a long way for your ratings. As a driver you are required to have a smartphone to be able to gain access to Uber’s technology. Since you are working, it’s only smart to have a charger to keep your own phone charged fully at all times anyways. So, naturally you should have at least one phone charger in the car anyways. I have an android and I always keep my phone plugged in while driving so anytime someone needs an android charger I just have to simply unplug my phone. Since many have an iPhone, you should get a second USB cable for their device as well on Amazon, or vice-versa. And considering I get asked for a phone charger all the time this is worth the 5-10 dollars to buy one. I’ve made this mistake before and it definitely cost me. Time, money, and a crappy rating for it. Just verify it’s truly them by asking what their name is or it could cost you the same. We live in an on demand world. Everybody expects convenience and that’s part of Uber’s business model. If you’re showing up 10-20 minutes after the estimated time Uber gives the rider, you’re probably gonna have an unhappy person. A person requested a ride in a downtown suburban area. I drove to exactly where the dropped pin was and then immediately texted the person my exact location. I was at the corner of two streets and told him that and named the business I was in front of. After 10-15 minutes of exchanging texts on the location he tells me the name of the bar he was at. It was literally 10 feet from where I parked, but him being ignorant made me drive and park exactly in front of the bar. This involved me spending an extra 5 minutes driving around the block because there was no way for me to turn around ( He should’ve just walked 10 feet to me, would’ve been easier and faster). When he got in the car he started screaming at me with belligerent words and kept dropping the F-bomb on me because he had to wait an extra 15 minutes than he was suppose too. End of the trip I gave him a 1 star (would’ve been zero if it was an option), and I know if he rated me it probably would’ve been the same. Point is, his fault or not, he had to wait longer and wasn’t to happy about it. This is the number 1 complaint Uber gets from their customers. Taking wrong turns and not using navigation (Google Maps) will make the trip longer and cost more for the rider than what’s necessary. As well as make the experience dis-satisfactory resulting in a lower rating. No strong Odors, no muddy carpet, no ripped up interior. People love using Uber because the appearance is much more appealing than getting in a smelly, old taxicab. If your car smells the same as theirs, it won’t feel like an Uber ride. Me being a smoker (I know, I’m trying to quit), I unfortunately smoke in my car. With that being said, I actually found something that will kill strong odors like cigarettes or pet stains, not just cover the smell. You can get it on Amazon, and works great. You wouldn’t even think I smoke in the car it works so well. A car being driven with rugged sounding breaks, a broken headlight, and the dashboard illuminated with lights calling for maintenance is gonna make the rider feel they are sitting in a car that just came from the Derby after playing chicken a few times. I’m not ready to die, and the passengers, I’m sure, will be saying that in their head the whole ride if this is the case. Take care of your money maker before it gets put out of commission. And if that’s too much because you’ve had a bad day, then just turn off the Uber Partner app and take a break and until you can collect your thoughts and compartmentalize them. I think this especially goes for the female riders that you pick up. When I take people to the airport, the guy always has a 5-10 pound backpack that he carries while the female seems to have the 60 pound rolling backpack while she only ways 100 pounds. Ya, you should be able to handle your own luggage, but do you really expect a 100 pound girl to lift a 60 pound travel bag into your trunk? But, not everyone is gonna like your music and since they’re paying you should make them happy by offering to change the music to whatever they like. Honestly, most of the time they will tell you whatever’s playing is fine as long as it’s not to obscene. Sometimes it’s the passenger that will get me lost, but out of respect you can’t just ignore the directions they tell you. If you do they will feel disrespected. Other times passengers just would rather take the scenic route. This one couple I picked up I had to drive them 30 minutes to their destination. On the way I noticed my GPS telling me that to take the highway, but there was also the option to take the back-roads. It was only a minute difference. So, I asked them and they said to take the back-roads. We found Bambi, a wolf, and almost ran over a skunk, but the couple was delighted with the experience because it wasn’t a direction they went before and they enjoyed all the wild life they saw. Had I taken the highway the ride would’ve been boring and dull. The passengers enjoyed the ride a lot more and I certainly did too. If anything, these are more important than the do’s because negativity always causes a worse experience than just being dull. Sometimes you need to look at it from a customer’s perspective. Yes, I love tips, but as a customer if someone tells me to give them a tip I’m more likely not to give them a tip. My reason is because you need to appreciate what’s given instead of expecting it. Do we deserve tips? Ya, of course. We’re providing a service. But, even when someones asked me how much of a tip I should get, I never give them a straight answer because then I just sound greedy. I let them decide how much. Plus there are times where people have asked and in my mind I was thinking 5 bucks and then they go ahead and give me a 20. If I told that person how much, I would’ve lost $15 cause of it. Plus, asking for tips makes people feel uncomfortable and that will just result in lower ratings if you don’t get deactivated first if the person were to complain to Uber about the situation. If the passenger rolls down the window that’s one thing, but you doing it first shouldn’t be an option. You don’t know the person. They could’ve just did their hair and make up because they’re taking an Uber so they can drink during their date. Now you’ve messed it all up and they have to redo it when they get to the restaurant. Just run your AC, but make sure the riders are comfortable with the temperature. This coincides with asking for tips. If you ask for something, you usually don’t get it. If the customer asks about the ratings, feel free to explain how they affect you, but don’t go pressuring people into giving you what you want because while you’re driving it’s all about them. If you’ve got a hot cup of coffee in your hand while you’re driving, what’s going to happen if you fly over the speed-bumps, potholes, and dodge other cars in the process? You’re going to burn yourself from spilling the hot drink. Then you drop some F-bombs because that really burned. Pretend every rider has a hot drink in their hand. If you don’t and act like your running from the police, then the riders are gonna burn you with low ratings which might just burn as bad as the real thing. First off, this is the law in most places nowadays. So, if you are committing these acts of treason you’re breaking the law most of the time. Even if you’re not breaking the law and using Bluetooth, it’s just gonna annoy the crap out of the passenger. They wanted a ride, not to hear what your plans were after you dropped them off. Some people might have a headache and you could make it worse this way. The rides aren’t gonna usually be more than 20 minutes, so just wait until after you drop them off to make your calls or text your friends. 1.) Doing this keeps you from getting a ticket. 2.) You’re increasing your chances of being kicked off the Uber platform, especially if someone reports you. 3.) Isn’t reason 1 and 2 good enough? Besides the safety issue with this, I believe passengers have that more secure, comfortable feeling when they can see your phone too. For example, my GPS isn’t perfect and I do have people that will watch my phone and make sure it’s telling me the right directions. Passengers have told me to turn earlier than what my GPS was saying before. Just get a car mount on Amazon. They work well. What I mean by this is beginning a trip before the passenger even get’s in the car. Nobody likes that. As well as, starting and ending a trip without ever actually picking up the passenger. If people are getting charged before they ever got in a car, you know they won’t be happy. So, as soon as Uber asks them to rate you, obviously they’re gonna give a 1 star to somebody they never actually met but got charged for or for getting charged too early. This won’t be true with every rider, but unless they start the conversation I try not to speak. they’re paying for the ride. So if they want silence, that’s what I’m gonna give to them. If you talk too much to the wrong person that was hoping for some peace and quiet, they won’t be happy with the ride resulting in, of course, a bad rating. In reality, only 2-3% of drivers are at risk of being deactivated. So really, most people don’t need to worry so much. But, for the ones that take pride in providing great customer service and receiving high ratings will definitely help from this list of tips on getting 5 star ratings as an Uber driver. Do you have any other tips to add to this list? What’s your Uber rating like? Another good way is to learn about your city and be a tour guide for some of your Riders. They certainly do appreciate it and I’ve gotten a lot of tips because of it. I’m ubering in Portland, OR for 1 year and about 3 months. I always keep water, snacks, candies, etc in my car and do what is on your list, but still getting low ratings for no reason. Used to have 4.97, now its 4.91.People can be very picky and feel that they are top of the world!!! Hello I drive in Phoenix,Az with a rating of 4.94 which I really don’t think is spectacular but alot of riders comment on how they rarely have seen a number that high. Is there a way to find out the average rating for a city? A 4.94 rating is pretty good! While I’m not sure about your city average, from my understanding, nationwide the average for all cities is a 4.8 star driver rating. Some cities may be higher or slightly lower, but I want to say that’s probably what Phoenix’s average rating is close to. While I haven’t personally asked myself, you can probably send a message to Uber support team asking. go to Account>Help>Change Account Settings> I have another account issue> ask for the average driver rating in your city. Let me know what their response is. I drive in the Seattle/ tacoma Washington Market and have only been doing so for the last 5 days. Day 1 I also surveyed every rider with the question what is one thing you would like to have in your next uber ride to use or consume. I got the standard replys for late night trips of strippers and more alcohol but of the ones who were not drunk I was told water for rehydration, phone chargers, snacks. Needless to say this has been pretty much the same response that I have been getting with every rider. I have even gone one step further and created a google voice number that forwards to my call phone where I can receive text messages and calls without giving my real number. So that the client no longer needs to wait for ever sometimes for an uber. Just simply call or text me when you’re going to need an uber and I’ll show up once I am outside request your uber and I should be able to receive your request and accept it. The customers I have told that too in the last week have already stated taking advantage of that with it being said that they get tired of having to learn someone new and a new face. Sounds like you got the whole works going for you. I love how you did a survey for all your passengers. It’s a smart way to see how you can make people happier. Be sure to buy or make yourself a tip jar to earn some extra cash for the extra amenities you are providing. This will help offset your cost plus help pay for your tank of gas. It’s a great strategy to use a different phone number. I personally don’t give out my number or fake number. It might’ve been a great ride, but I’m kind of sporadic with my driving hours and don’t want people to expect to depend on me. 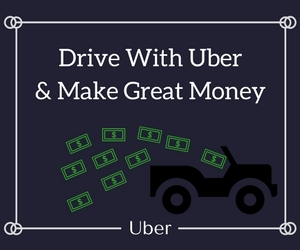 But, if you want to take Uber seriously, it can be a great way to gain more clientele. If you ever decide to provide alcohol and strippers let me know;) I might request you. I’m a 9.92 average and I do everything you’ve suggested…pretty much common sense social awareness. It came up the other day about star ratings with a customer and they had no idea that a 4-star was bad for the driver. Many are under the impression that the ride must be absolutely perfect for 5 stars and will almost always give 4. I’m tempted to have a simple sign explaining the lame star system and that 5=good job and 4=termination. Uber should have a 10 star rating system and use 8.5 as the low mark. sounds like you mean a 4.92 star rating? Either way that’s pretty impressive. I do get what you are saying though. When you look up hotels you consider 4 stars a good rating, but it’s totally different in Uber terms. Since you’re doing great without the sign I wouldn’t worry too much about. As far as the rating system, I do feel it is bogus, but what are you gonna do about it? Being an optimistic person I always try to hope for the best. So hopefully one day Uber will set up a better system for us. Tell me. With such a good rating do you have any other tips to share for someone that’s struggling? In Brazil, I usually carry some pills for headaches in my car as aspirin, among others. If the passenger says he has headache, I say I have some pills and say brands. As I am no doctor, I never offer the drugs, just say the brands of pills I have. If match what the passenger usually take, I offer. Carrying different items like aspirin can definitely be nice to have with passengers. The ones you give it to I’m sure will give you a 5 star. However, It’s not an item I carry. I don’t even carry any for myself at my house, to be honest. Not an item too many people would need. But, that doesn’t mean it doesn’t have benefits for other drivers. Thanks for sharing what item you carry with yourself.